Outset Pub Baskets are perfect for burgers, sandwiches, hot dogs and fries! 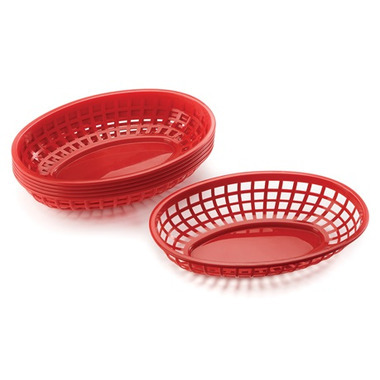 Designed for use with Outset Burger Basket Liners. Dimensions: 9.5" x 6.25" x 2"
These are not your average dollar-store baskets. They have a much better "feel" to them. Not only that they are dish-washer safe :) I bought these as my 6 yr old granddaughter will be here in the summer and thought these would be fun for her, particularly, but also because it's just an easy way to serve a burger or hot-dog or sandwich for that matter.